A very tasty, interesting and comprehensive package. 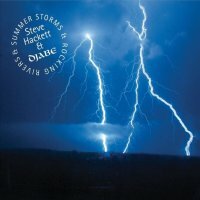 Steve Hackett has a history of collaboration, with Hungarian Jazz Rockers Djabe being regular soulmates. This two disc (CD/DVD) release captures them performing together during a live show from 2011. Hackett's name may appear first on this release, but for me it feels more like a Djabe gig with Hackett being a special guest. I'm not a devotee of Jazz, I find five musicians all playing different tracks at the same time somewhat off-putting, but there's very little of that here, just occasionally does the overt Jazz stuff crop up and then generally only briefly. A case in point being 'Dark Soup' which only appears on the DVD within this package. For the purpose of space, the CD doesn't include the full show. Hackett's tracks may be the more familiar but much of the Djabe material is extremely agreeable, such as opener 'City Of Habi' with its laid back ethnic feel that builds to Hackett's intense solo. Ferenc Kovács' extended violin intro to the excellent 'The Steppes' is rather more pleasing than Rob Townsend's sax version on Hackett's recent tour. Tamás Barabás' bass is delightful on this selection, as it is across the show. The song 'Butterfly' starts with him just playing bass and it's delightful, when the band joins in it reminds me a bit of Weather Report. 'Scenes – Above Poland' and 'Scenes – Sunset At The Seaside' are very pleasing, and Hackett's on top form with his acoustic guitar interlude – playing 'Classical Gas' alongside the usual suspects. The band does a fine job on the instrumental version of 'Firth Of Fifth' and the trumpet taking the lead in 'Ace Of Wands' is really effective. As Hackett probably drew inspiration from Djabe when creating 'Last Train To Istanbul', it's not a surprise that it appears here, the violin working particularly well. The next portion of the show features Djabe material, including the two tracks that make up the title of this release, the latter being played entirely on (identical but different sized) unnamed wooden instruments by seven protagonists, including Hackett, before the familiar Genesis classic '...In That Quiet Earth' rounds out the main show. DVD extras include Hackett playing 'Jacuzzi/Overnight Sleeper' with an orchestra in 2013, a twenty minute documentary and a slightly bizarre promo video of 'Tears For Peace', a Barabás/Jo Hackett co-write which appeared on a Djabe album. A very tasty, interesting and comprehensive package indeed.